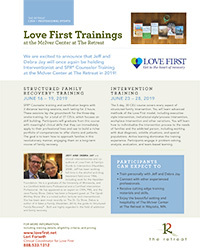 We are excited to announce that Jeff and Debra Jay will be holding Interventionist and SFR® Counselor Training at the McIver Center at The Retreat in June! SFR® Counselor training and certification begins with 2 distance learning sessions, each lasting for 2 hours. These sessions lay the groundwork for the three-day onsite training, for a total of 27 CEUs, which focuses on skill building. Participants will graduate from this course with meaningful clinical skills that they can immediately apply to their professional lives and use to build a richer portfolio of competencies to offer clients and patients. The goal is to learn how to approach families in this revolutionary manner, engaging them on a long-term course of family recovery. The 5-day, 30 CEU course covers every aspect of structured family intervention. You will learn advanced methods of the Love First model, including executive-style intervention, invitational-style / process intervention, workplace intervention and other variations. You will learn how to individualize the intervention process to the needs of families and the addicted person, including working with dual diagnosis, volatile situations, and special populations. Active learning dominates the training experience. Participants engage in problem solving, analysis, evaluation, and team-based learning.